Don’t just take our word for it — see what the rest of Las Vegas, Henderson, Green Valley and Summerlin are saying about Legacy Home Care! It is my pleasure to be associated and work closely with Andi Graham and her team of dedicated caregivers. Their focus on each client’s individual needs is exemplary and we are proud to have Andi as a fellow member of The Senior’s Choice. We at The Senior’s Choice support more than 130 in-home companion care companies around the world and we take pride in the standards of excellence common among all our members. Legacy Home Care represents the best of The Senior’s Choice because of their demonstrated integrity, commitment, and love for seniors and their families. We know that those individuals who take advantage of Legacy Home Care’s services will experience greater peace, independence, and more quality time with their loved ones. Who better to carry on the Legacy of Rochelle and the Concierge Service business she started with Starfish Resources than Legacy Home Care! See the Press Release from April 2016 – Rochelle has forwarded ALL of her Las Vegas clientele to Andi at Legacy so that they can continue to receive the Highest Level of Service in the Las Vegas Valley. We are in Summerlin. 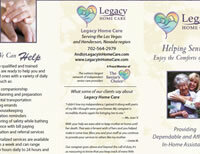 Legacy had been caring for my father who has Alzheimer’s for a while at his home in Henderson. When my 92 yr old mother fell and fractured her pelvis she was moved to our home as well as my 96 year old father. Legacy transferred his service and his caregiver Jaye to our home. Jaye has been wonderful. Treats my father with kindness and respect. We had to add service for a second caregiver for my mom. Regina then came into our home. What an angel. Mom has been a difficult patient as she is in so much pain and Regina has been awesome. Legacy’s whole operation has been stellar from Andi in management to caregivers. I really don’t know what we would have done without them. I think Kathy is the best and if she has anything to do with your situation at home you can mentally rest and know that everything will be taken care of by her! 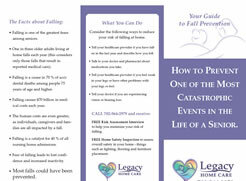 Legacy Home Care is by far the most professional home health care we have found for my 94 year old mother. I attribute Mom’s improved health to the care provided by Andi’s kind, considerate, pleasant, and professional staff. Mom has a great rapport with her CNA, Patricia who accompanies her to Dr’s appts when due to work conflicts can’t attend and even takes Mom to church on Sunday! Unbelievable!! 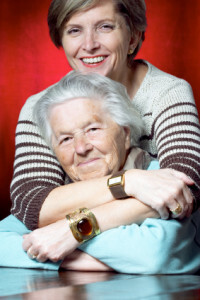 Legacy Home Care provides peace of mind to my family and wonderful companionship to my Mom every day. Many thanks. The best way to explain what Legacy’s done for me is just list some of the things Andi Graham and her staff have done for me. I’m visually impaired and cannot read or drive. I started working with Legacy when my partner was admitted to hospital with end of life illness. Andi helped me take food and personal things to my spouse and help me deal with applying for Medicaid and nursing home bills. Andi also assists me with banking and the closing of my spouse’ estate. She is a CPA and very trustworthy. She even took me kayaking on Lake Mead to spread my partner’s ashes. Andi and her business partner John helped me complete the VA paperwork to apply for benefits as surviving spouse. She also helped me receive $1,000 in free RESPITE care when my spouse was in the hospice. They have done everything I’ve asked and more. As a former attorney, I highly recommend Legacy as a responsible provider. I needed home care after surgery. My doctor requested Legacy Home Care. After talking with Andi, I knew this would be the perfect home service I would need. She is warm and friendly. She is very passionate and really cares from her heart. My service was way above my expectations. Julie, my home caregiver, is amazing. She does everything she can to make sure you get what you need. She personally gets 5 stars from me!! Everything was very smooth right down to every last detail. I will be using them in the future. 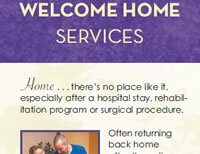 I recommend this service to anyone that is looking for excellent quality home care! Love you guys!!! Andi and Ortie at Legacy has helped me with my day to day needs but also found out that I was entitled to VA benefits! They treated me like family. I recommend them to every one I know. I requested information this morning and Andi contacted me before noon! Great customer service! Thanks so much for all you do.